I’ve just finished reading a book I got through the suggestions from Amazon. 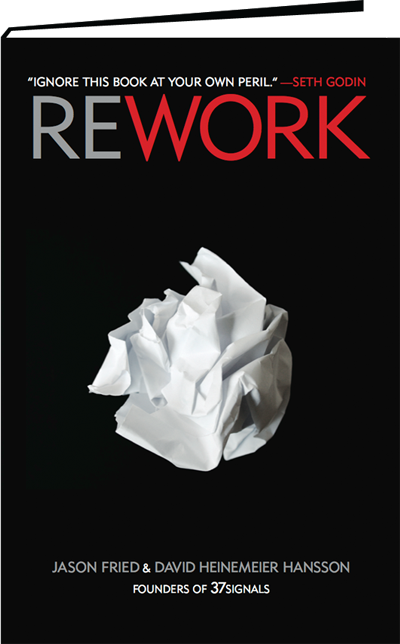 The title is ReWork and comes from the experience of Jason Fried and David Heinemeier Hansson, founders of 37signals, a small company that sits behind some very well known web-based applications such as BaseCamp, or technologies such as Ruby on Rails. The book has been really a great reading experience. Concise, interesting, filled with easy to implement tips. While reading it you have the clear feeling of noting many obvious things, usually a good sign when reading a Business Book. Yet, there’s something about this book that made me feel I should recommend its reading. One of the original artworks available in the book. First of all, the authors are very clear about their ideas about growth and size. What we all tend to consider a “must” in business terms, is considered as something that should not pursued at all costs. Based from their business experience, the key message they try to carry is that size is negative for businesses, especially in their initial phases, as it adds complexity and costs. A second message that I really loved (maybe because it is so in line with my personal thoughts) is that Planning is Guessing. blinders on you. “This is where we’re going because, well, that’s where we said we were going.” And that’s the problem: Plans are inconsistent with improvisation. Another disruptive message for many, that is also really true. Especially if you think how much time many companies spend in planning activities (budgeting among all) that are very often completely disconnected from reality. Last but not least, is the underlying exemplification of how simplicity can be a real business differentiator. And their proposal is to implement simplicity through simple and concrete actions, not as a simple underlying philosophy too difficult to implement in reality. The authors are also very effective in denouncing some meaningless trends in modern business practice: from the over-exposure of start-ups to the dangers of workaholism. A really good read you should not miss.